Sterling Power Pro Batt Ultra Battery to Battery Charger - 12v 30A BB1230. ALM Electrical Solutions is the UK's premier supplier of auto electrical parts and products. We aim to provide the best online shopping experience available to both trade buyers and weekend enthusiasts. To view a full range of available products. As we are sure to be able to locate it for you. The Pro Batt Ultra is a DC to DC charger that is installed between a battery that is being charged by the alternator and an additional battery that you wish to charge. The BB1230 charger provides a 5 stage charging profile to any leisure or house batteries that you wish to charge resulting in substantial charging improvements over the standard alternator setup and improved health and maintenance of your batteries. The BB1230 will boost the voltage to the batteries if input voltage is too low & reduce the voltage if the supply current is to high ensuring the optimal charging current is maintained at the batteries. The BB1230 is fully compatible with the latest EURO 5/6 Regenerative Braking Systems and smart charging alternators where a standard split charge relay does not suffice. Compatible with Mercedes Benz Blue efficiency, VW Blue Motion, Ford Econetic and Vauxhall Ecoflex systems amongst others. Automatic for most non vehicle applications. Regenerative braking (requiring ignition feed). Automatic regenerative braking, requiring no ignition feed. The Current is NOT taken from the input battery and given to the output battery. The B2B uses alternator power to charge the output battery. Manual mode and regenerative braking mode allows you to override this. 100% fire proof plastic box. Night Time Setting: Allows the unit to ran at half the power so the fan noise is kept down. Boost / Reduce Charging: The B2Bs ensure batteries get the correct charging profile irrespective of high or low input voltages. B2B turns on at 13.3V and turns off at 13.0V Thus, does not drain input battery. Regenerative braking mode allows the input voltage to drop to 12.2V. Customizable Profile: Choose your own charging profile on the front panel. 9 preset battery chemistry options: Including AGM, LiFePO4, Gel, Flooded and sealed lead acid. 4 stage battery charging: The B2B charges batteries between 5-20 times faster than a stand alone alternator. Very Simple to install: No electronic Control Unit (ECU) issues. Fully prepared for smart alternators (regenerative braking). The item "Sterling Power Pro Batt Ultra DC-DC Battery to Battery Charger 12v 30A BB1230" is in sale since Thursday, February 2, 2017. This item is in the category "Vehicle Parts & Accessories\Motorhome Parts & Accessories\Campervan & Motorhome Parts". 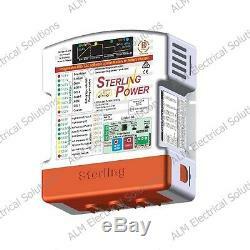 The seller is "alm_electrical_solutions" and is located in Redditch, Worcestershire. This item can be shipped to United Kingdom, Austria, Belgium, Bulgaria, Croatia, Cyprus, Czech republic, Denmark, Estonia, Finland, France, Germany, Greece, Hungary, Ireland, Italy, Latvia, Lithuania, Luxembourg, Malta, Netherlands, Poland, Portugal, Romania, Slovakia, Slovenia, Spain, Sweden, Australia, Canada, Brazil, Japan, New Zealand, Israel, Hong Kong, Norway, Indonesia, Malaysia, Mexico, Singapore, South Korea, Switzerland, Taiwan, Thailand, Chile.